Barmouth/Abermaw01341 280787work TownBarmouth, or Abermaw or even Y Bermo as it is known in Welsh, is southern Snowdonia's most popular seaside resort with breathtaking views of Cardigan Bay and the picturesque harbour. The town's beach, Abermaw, is west facing with a mixture of sand and some fine shingle and is ideal for bathing and watersports. The town can get busy, a land train runs along the promenade and there are traditional donkey rides, swing boats and amusement arcades. 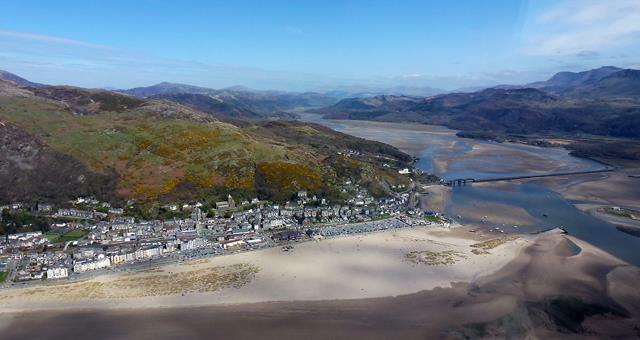 Barmouth beach is vast with good disabled access to the beach and all leisure amenities, including a full range of shops, cafes and pubs are within a short distance. There are several delightful walks of varying distance which start in Barmouth and follow routes into the hills beyond. At low tide it is possible to walk all the way to Harlech to the north with wonderful views over Tremadog Bay. The town is located on Route 8 of the National Cycle Network and the traffic free trail from Barmouth to Dolgellau along the Mawddach Estuary offers spectacular views. Dog restrictions apply between May and September. Barmouth developed on the back of the shipbuilding industry, lying as it does on the Mawddach river estuary, but then flourished into a popular seaside resort. 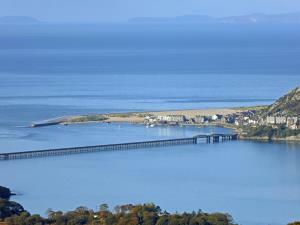 An iconic feature of the town is Barmouth Bridge, the 136 year–old railway viaduct across the Mawddach Estuary. It is half a mile in length with a wooden promenade suitable for pedestrians or cyclists which now forms part of the Wales Coast Path and the Lon Las Cymru Cycle Network. Morfa Mawddach railway halt is situated at the other side of the bridge, for legs too tired to walk back! Enjoy a short walking tour of Barmouth's Maritime Heritage by visiting the Sailor's Institute, Ty Gwyn and Ty Crwn all situated around the harbour and open during daylight hours only with free admission. "With a fine sea view in front, the mountains behind, the glorious estuary running eight miles inland, and Cadair Idris within compass of a day's walk, Barmouth can always hold its own against any rival." Notable buildings in the town are the medieval Ty Gwyn tower house and the nineteenth century Ty Crwn roundhouse prison. Another building in the centre of town which has shot to fame - or infamy - in recent years is the 'Arousal Café'. Originally named Carousel Café, the letter C was stolen soon after the sign was put up. The owner has regularly attempted to replace the C letter, only to find it missing again the following day. At the time of writing, he has ceased trying to reinstate the 'C'. Ty Gwyn dates back to 1460 and is one of the first four buildings to be built in the shelter of the anchorage. It was built by Gruffydd Fychan of Cors -y-Gedol as a potential escape route. Later, Jasper Tudor, Earl of Pembroke lay concealed in the building with his ward, the future King Henry VII, when plotting the downfall of Richard at the Battle of Bosworth. Ty Crwn (the Old Gaol) situated just behind Ty Gwyn, has two figures showing what life was like a prisoner in 1830. The Sailors' Institute is probable the last remaining example of its king in Wales. Erected in 1890, the Victorian Reading Room is a fine example of its time. The building houses many artefacts, pictures and paintings and the daily newspaper may still be read free of charge. Artefacts including those form The Bronze Bell Wreck, which was discovered by local sub-aqua club members just off the coast, will soon be on display. The vessel foundered in a storm in 1709 carrying a cargo of Carrara marble from Genoa. The most beautiful find was the Bronze Bell, clearly marked 1677. Local sculptor Frank Cocksey has been commissioned to carve one of the marble blocks as a unique piece of art to be sited within the new harbour side improvement scheme. Barmouth has a railway station on the Cambrian Coast line from Machynlleth to Pwllheli. Barmouth, or Abermaw or even Y Bermo as it is known in Welsh, is southern Snowdonia's most popular seaside resort with breathtaking views of Cardigan Bay and the picturesque harbour. The town's beach, Abermaw, is west facing with a mixture of sand and some fine shingle and is ideal for bathing and watersports.